Ashton Hall, the headquarters and home of Lancaster Golf Club, lies about 3 miles outside of Lancaster, just off the A588. The hall was originally a 14th century tower house, but has been added to at various times in the past, most notably in 1856. The original tower was built sometime in the 1300's, and is made of local red sandstone. This part of the building stands out in contrast to the later additions which are mainly built in grey limestone. The original building is a rectangle with four diagonally projecting towers. The towers and the main body of the older part of the hall, retain the 15th century battlements. Nearly all the original windows have been blocked up and replaced with corbelled windows some time in the 1500's. If you look closely at the walls, the original windows can still be seen. The hall was the ancestral home to the Lawrences, and was probably built by Edmund Lawrence who died around 1381. 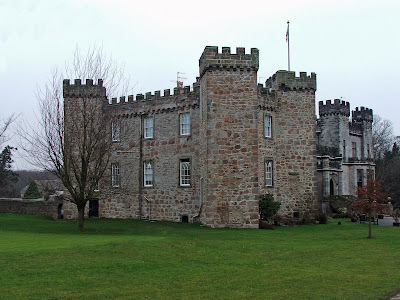 The Lawrence family held Ashton Hall from the early 14th century until the early part of the 16th century. The more recent addition to the hall dates from 1856, and was built on the site of a 17th century wing that was demolished to make way for the new building. The earthwork remains of medieval fishponds can still be seen in the grounds of the hall. I am a DIRECT DESCENDANT of SIR ROBERT LAWRENCE who is probably the original Lawrence of this family, at least he is the farthest back ancestor we can trace so far. He was born about 1150AD (perhaps 10 or 20 years earlier) and he was Knighten by KING RICHARD the LION-HEARTED for his service & bravery in the CRUSADES. We were told he was also awarded either the castle or the land it sits also by King Richard for his service in the crusades. We carried the LAWRENCE name for 637 years (approx.) until one ancestor had only daughters (3) & the family name then changed to Hart (John Hart was one of the signers of the American DECLARATION of INDEPENDANCE in 1775 - he was from MASS. U.S.A. & was a prominent citizen of GROTON, MASS. -- eventually one of his descendants married John Webster, brother of NOAH WEBSTER of the DICTIONARY fame !!! I would LOVE to take my grandkids along with my family pedigree to the Golf Club members who now have possession of our family castle "ASHTON HALL" and hope they'd give of a grand tour and a couple nights stay if possible !!! I want my grandkids to actually REALIZE -- WHO THEY ARE !!!!!! They currently have no such sense & no pride in where the come from. This is OUR DREAM (my husband & mine's)!!! SINCERELY, The Baroness Lady Barbara Ann (nee Barker) Hansen -- S.W. FLORIDA, U.S.A.
Married by Licence by: Franc. Lee, Curate. Hi there!! I'm another decendent, but without the titles and all. Actually, my family went to TN, and fought the British and Yankees just as Robert did in the Crusades, and they were just as brave. I too want to see Ashton Hall. The comment by anonymous is interesting indeed. I have pursued the Lawrence Line for some 10 years and have yet to find a proved pedigree from Sir Robert. The works of Summerby (circa 1850) and that of Schuyler are the only two I have located. The Lawrence-Townley scam of the 19th century have managed to garble up the colonial lines, almost making proven facts indiscernable. I have gone to DNA markings but find participation to sparse for much help. DNA may be the only option that can unravel the problems. I would be delighted to know the pedigree mentioned by the author. I'm also a direct descendant of Sir Robert Lawrence who was born 1150 and knighted by Richard I for service at Acre in Palestine during the 3rd crusade as "Sir Robert of Ashton Hall". The arms of the family are "ARGENT, a cross reguly gulos". My family still carries the Lawrence name. My uncle is the 10th John Lawrence in our blood line and his son, my cousin, is the 7th Robert Lawrence in our blood line. The original coat of arms belonged to Sir Richard Lawrence gained at Acre during 1st Crusade under Richard I. In 1980, more than a decade before I was born, my great uncle made a book with the Lawrence family history back until Sir Richard of Ashton Hall who is father to the first Sir Robert of Ashton Hall, the Lawrence's really liked the name Robert. I think it's pretty funny that Ashton Hall is now a golf course because my grandpa is crazy about golf, I'm sure he would like to visit it someday.